I have to admit, I have pampered poultry. I give them lots of greens in the winter, in the form of alfalfa hay and whatever veggie scraps we have from the kitchen. I also let them free range as much as I can, with our dry winter so far they have gotten to do a lot of that lately. But it isn’t all one sided. 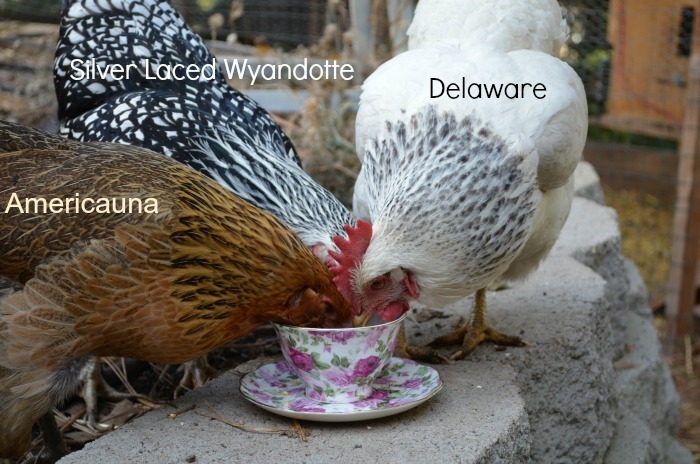 They provide us with an abundance of luscious, rich flavored eggs. Not only are they yummy but they are quite pretty too. Almost as pretty as the ladies themselves. Tuesday after a long day in the studio I walked in the garden (barren as it is) with an afternoon cup of Rose Scented tea. With something colorful in my hand the Ladies knew for sure I had a treat for them and followed me around expectantly. I set my cup down so I could get them some scratch grains and they figured their treat was in the cup. They finally let me have it back after I tossed the grain to them. This beauty is a Swedish Flower Hen. I have two, the other has the fluffy top knot. I have a variety of chickens. A gorgeous collection of different breeds. They were perfect ladies and made sure to take turns with the cup. I also have Black Copper Marans, Speckled Sussex (actually you can see the back end of the Speckled Sussex in the photo with the Flower Hen), Black Star and a Wellsummer. The eggs they lay are as varied in looks as they are. I have more rare breeds on my “wish” list. I hope you enjoyed our tea. Come again and I shall share the treat I had for myself. It has some of these in it. « Sending you some flowers! I envy your beautiful space with a complete work area for creating and those beautiful chickens! 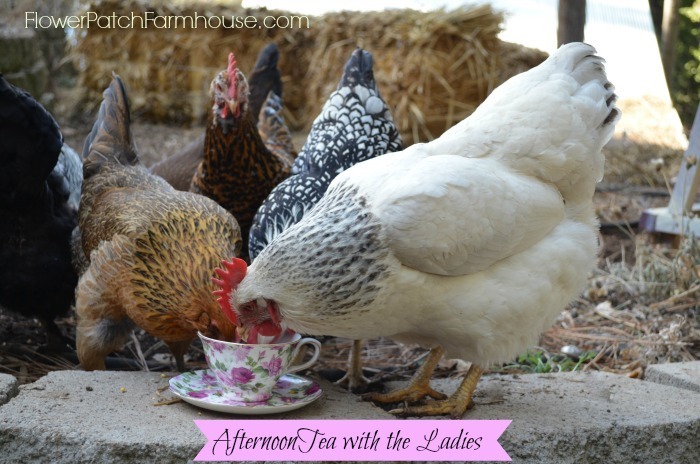 I live in a neighborhood so its not an option but I would love having these ladies for afternoon tea. The eggs are quite colorful and I do remember that a fresh egg is an awesome flavor. How long have you tended to the ladies? Thankfully our little neighborhood does not restrict chickens. I don’t keep a rooster as my neighbor was bothered by his nocturnal crowing. I have had chickens for about 15 years now and love every minute of it. i thought my girls were spoiled, i never thought to give them alpha hay. we have horses so i bet the girls have been helping themselves and i didnt realize. love the pics! Mine love the alfalfa and I can sure tell the difference in the yolk color of the eggs when they get all that extra chlorophyll. With nothing green for them to forage on in winter here it makes the most sense for me. Though with the drought the cost of the alfalfa has gone up. But they are worth it. 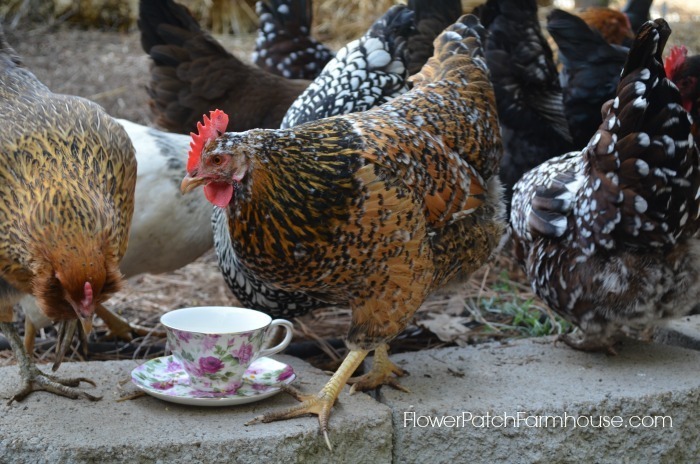 Your hens are absolutely gorgeous! They are so colorful and healthy-looking. 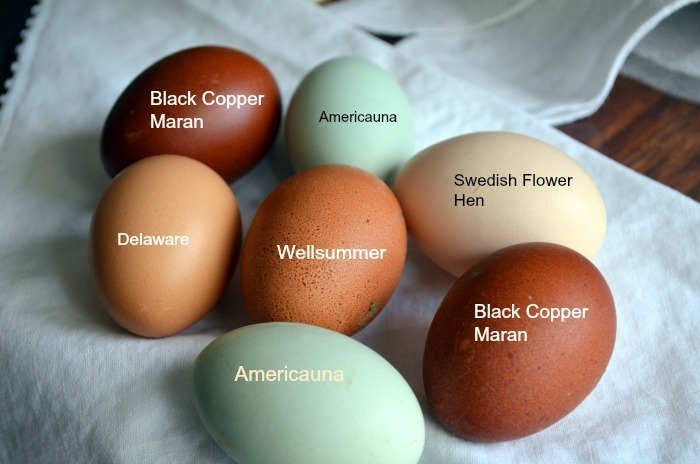 I’m amazed at the variety of rich colors in their eggs. 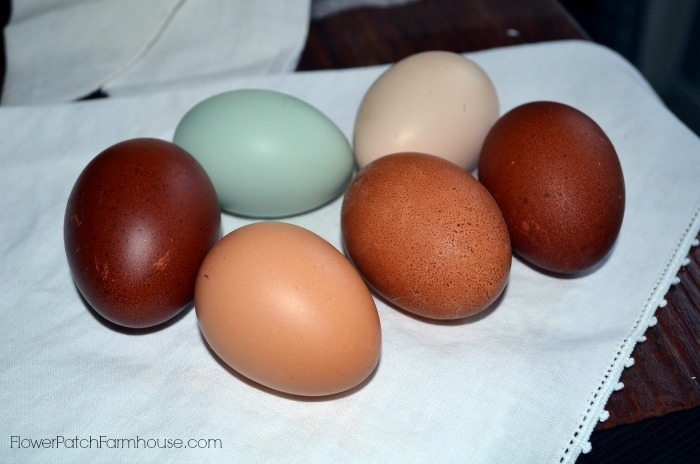 Beautiful ladies and they produce such gorgeous coloured eggs. They do, I am hoping to get some that lay a more olive colored egg in the next few months. Very interesting color. Lovely hens and lovely looking treat. 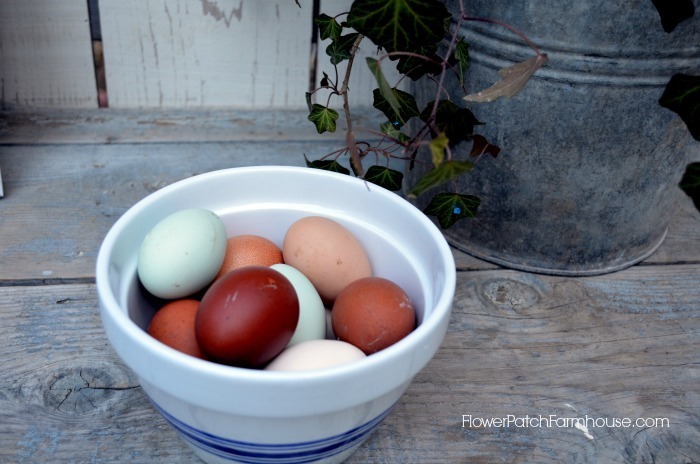 Fresh eggs are so much richer. And hens are lovely company! My hens do keep me entertained and I look forward to going out each morning to feed and talk to them. Even on the coldest of days. Yes, store bought eggs just do not have flavor like from your own chickens. Hi Pam! Great to see you… Love your new blog design and your girls are lovely… Thanks for the tea! You do indeed spoil your feathered friends. Their eggs are too pretty to crack. I am fascinated by the colors different chicks are capable of laying.